This is the thing about being betrayed by the one that you love dearly, you almost want to tell the whole world about that person's not so good deeds. 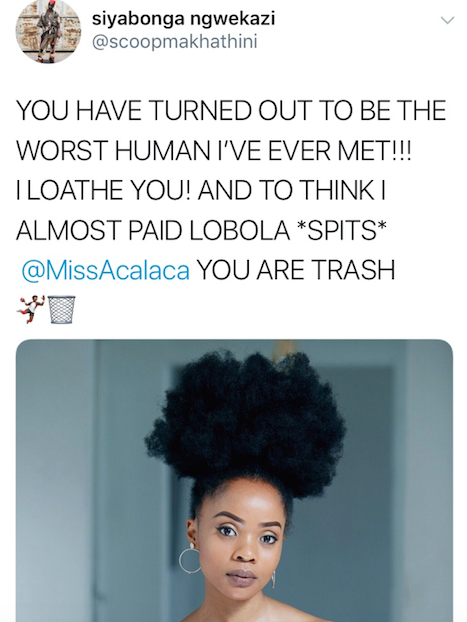 Such was the case with one of Mzansi's most revered hip hop commentator and all round entertainer, Siyabonga Scoop Ngwekazi, who allegedly took to his Twitter page last night and vented about his girlfriend, Akhona Carpede - accusing her of cheating. Read: Scoop's Drama: I WAS HACKED! Twitter was lit after Scoop dragged Akhona as he posted a series of tweets expressing just how hurt he was by her actions. In one of the posted, he even included a photo of Akhona and the alleged guy that was regarded as a"Best friend" by her. However, a few moments later Scoop then stated that his Twitter account was actually hacked, therefore his rant about his girlfriend is false. This move from Scoop left many Tweeps wondering if his account was truly hacked or there's actually more to the story than meets the eye? Well, earlier today Akhona posted what seemed like a subtle jab surrounding her and Scoop currently. The general tone of her tweet have left many convinced that there was no hacking of accounts on Scoop's end, as he had maintained after the frenzy last night. It's interesting how she mentioned the word "loath" in this tweet as that's exactly what was tweeted by Scoop's alleged hacker. Curious Tweeps have been camping on Akhona's social media pages - waiting for a possible response, hence some simply did not buy into the fact that Scoop's Twitter account was ''hacked''. Below are just some of comments on the streets of Twitter. There truly seems to be more than what meets the eye with this story. The opposing ends don't seem to correlate their truths though, which also puts into question the whole hacking angle that Scoop resorted to.